The immense iceberg that's been parked in 'Iceberg Alley' on the coast of Canada's rugged Newfoundland and Labrador has reminded a lot of people it's time to book that trip to North America's eastern-most coast. You can only take a picture of an iceberg, but here are 5 unique, interesting souvenirs you can take home that you'll actually use, or give as gifts - and support local artisans and businesses. We've given you tips about each one, plus a high/low rating to help you decide where to save or splurge. 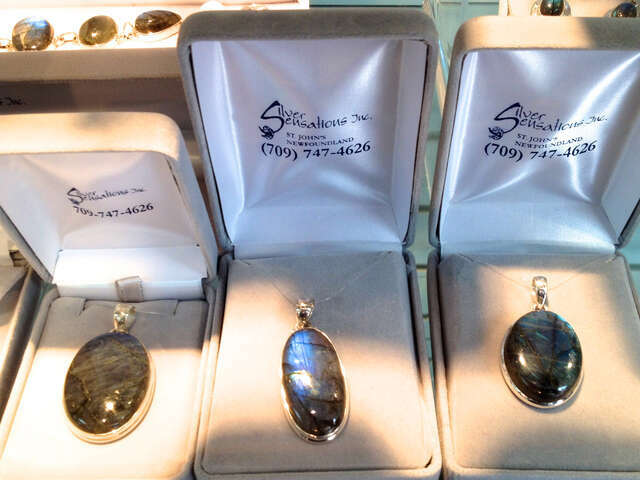 Labradorite is magical: moody, blue / grey / green with striations and life, with the appearance that light is playing inside the semi-precious stone - it's easy to see why it's said to be an incarnation of the Northern Lights. Labrador is the mainland part of the province of Newfoundland and Labrador. It was there Europeans first saw and named the stone in the 18th century, although labradorite was part of Inuit lore long before. Tip: movement of the piece is the key to the mythical play of color in labradorite, so choose jewelry to get the most motion and bring out its best. High /Low: Pieces set in silver start at around $50, and depending on the setting and the artist, can be worth many times that. 'Trigger Finger' Mittens: Hunting is a way of life in Newfoundland; just about everyone we met, including 'Townies' (people who live in 'town') fishes, AND hunts. With so much time spent outdoors in any weather, trust some clever Newfoundland knitter to come up with 'Trigger Finger Mittens'. So you don't have to take off your mitts to get the job done. Handy even for people who don't use firearms, too. Who wants to take off a mitten to use your index finger in cold weather? 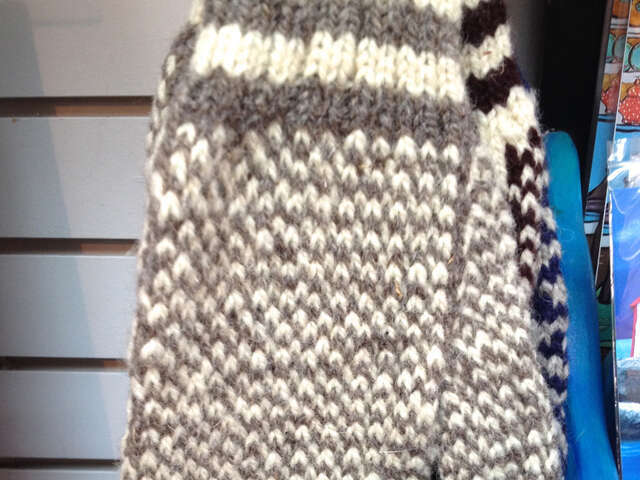 Tip: We found lots of big mittens, but searched high and low for trigger finger mittens that would fit women's hands. A friendly local recommended someone who made them who could supply them in women's and children's sizes. High/ Low: in the range of $15-20 per pair. Savoury: Yes, the herb. 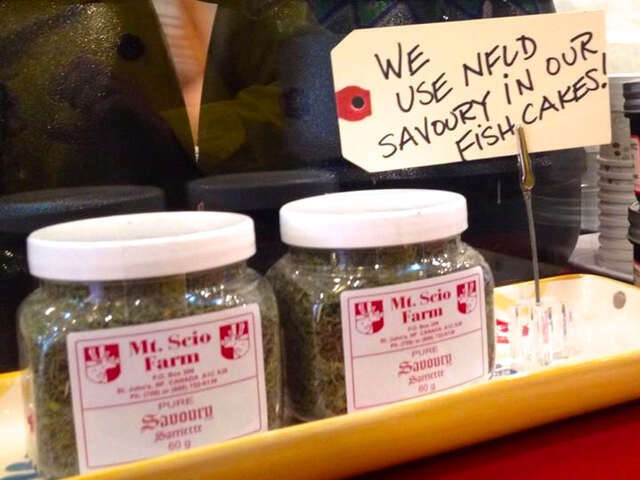 No one I spoke to seems to know how savoury became so indispensable to Newfoundland cooking, but it's a staple seasoning. Savoury is found in bread at restaurants, on iconic Newfoundland cod, and especially, as the key ingredient in dressing (aka 'stuffing'). In Newfoundland, 'dressing' is an everyday food, not just for Thanksgiving. You'll find it on menus as a side to upscale cuisine and even fish and chips. It's usually served along with gravy, and called 'D + G'. Tip: Use Newfoundland savoury in easy-to-bake biscuits. And definitely in dressing! A wonderful gift for a foodie friend. Sea Salt: One producer of sea salt in Newfoundland said it best: why should an island surrounded by the briny sea have to import salt? 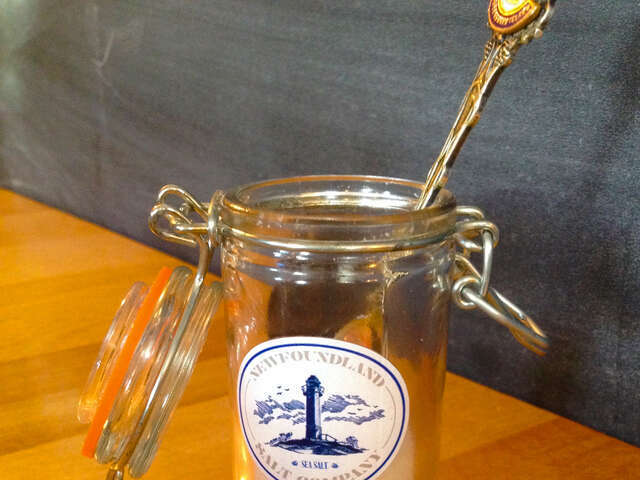 There are now a couple of businesses in the province who extract salt from the icy North Atlantic waters, and for any traveling foodie, a local sea salt is a treasure. Tip: use on lightly flavoured items like eggs or fish, where the salt's unique characteristics can stand out. High/Low: low, perfect for a foodie's stocking stuffer, maybe along with a bottle of Newfoundland savoury. Newfoundland Music: Perhaps the greatest export from Newfoundland, and contribution to Canadian culture, is its music. It seems every Newfoundlander you meet is a talented musician, and even casual parties feature live music and singalongs. While you're in Newfoundland, don't miss it: from festivals to kitchen parties to every bar on famous pub-lined George Street, live music is part of the Newfoundland experience. Don't forget to take some one-of-a-kind music home! 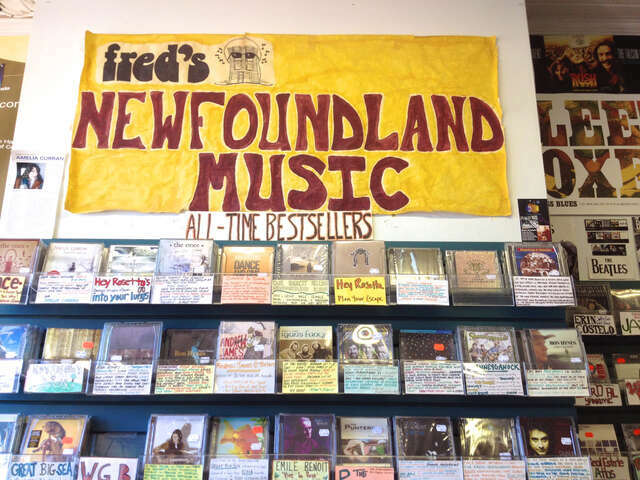 Tip: Fred's Record Store on Duckworth Street in St.John's has been selling and supporting Newfoundland artists for nearly 50 years. If you've forgotten what a record store feels like, don't miss it! Fred's also has free live music at times, so drop in and enjoy! High/Low: Low, $15-25, and what's easier to pack than a few CD's? Although there are many places to buy Newfoundland souvenirs, Duckworth Street in St.John's is a sure thing. Running parallel and close to the waterfront, Duckworth street is in the heart of downtown. 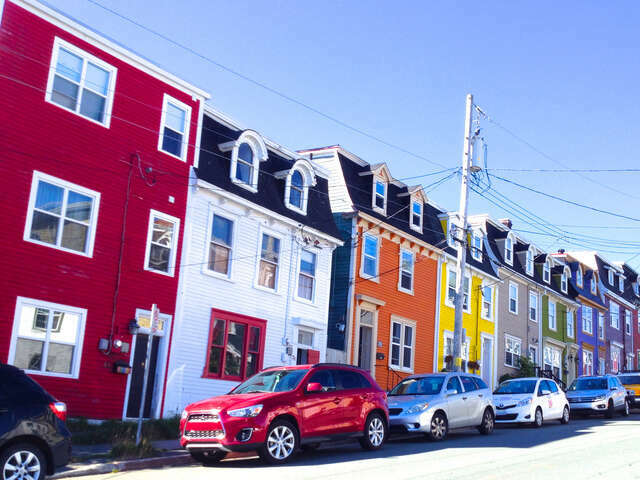 It's not only lined with shops, the streets running up the hill are charming examples of Jellybean Row, the brightly colored 'saltbox' houses that are iconic images of the city. This impossibly picturesque fishing village just outside St.John's (pictured top) is well worth a visit - for the scenery, its craft brewery, Mallard Cottage which one of the top rated restaurants in Canada, AND the Quidi Vidi Village Plantation. This dockside building houses artisan workshops, where you can meet the artisans, learn about their crafts, and buy souvenirs of your trip to Newfoundland.